In the Kitchen with Jason is proud to present one of the best recipes I have ever made. They are good for snacks, sides with dinner, or even as part of your breakfast and the best part: you can give one to your toddler and watch as she mows down on it like you have never fed her before (I promise that I feed her, she just acts like I don't). These two are mine, go make your own biscuits! If you only have normal shortening, this should work just as well. If you don't have buttermilk, put 2 Tbsp of white vinegar in a 2 cup measure and fill it the rest of the way with regular milk. In five minutes, you will have buttermilk. Super simple! Using a pastry cutter, two knives, or a fork (with a knife to scrape the extra off), cut in the shortening until it resembles a coarse meal. Put the dough onto a well floured surface and roll it into a round about an inch thick. Fold the dough into thirds (like folding a letter) and roll it out again to about an inch thick again. Using a 2 inch circular(ish) cookie cutter (or biscuit cutter), cut out the biscuits. Gather up the scraps and roll out the dough again. Cut out more biscuits from this remnant. If you have a bunch of scraps, you can do this again. 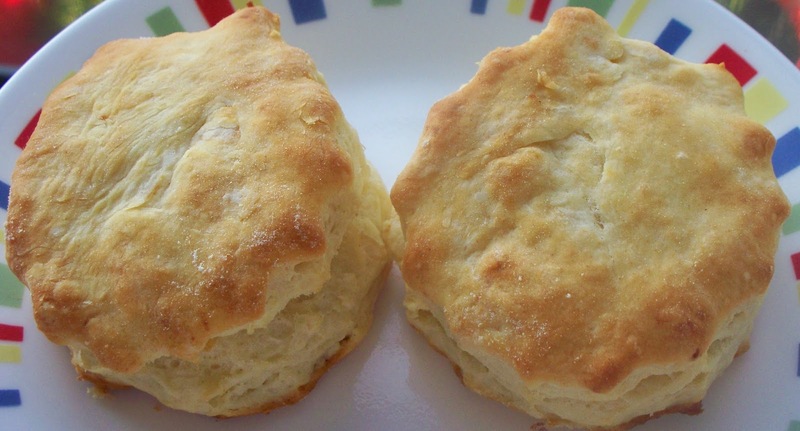 Place the biscuits onto a baking sheet and bake for 10 to 12 minutes. Either use a non-stick baking sheet or spray the baking sheet with cooking spray. Let the biscuits cool (if you can) on a wire rack. While they are cooling (or right before you eat them), brush the tops with melted butter. They are also good with honey instead of butter, and if you have any leftover meat product (turkey or ham are my favorites), you can make a yummy samich.